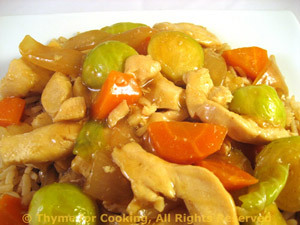 Stir-Fried Chicken, Brussels Sprouts, Thyme for Cooking healthy main course. Cut each sprout in half through the stem end. Cut the carrot in half lengthwise, then slice, 1/4 inch thick (.5cm). Cook rice: Melt butter in small saucepan over medium heat. Add rice and sauté, stirring for 1 - 2 minutes. Add stock, cover. Cook rice for length of time on package. When done fluff with fork and serve. While rice cooks: In large skillet or wok heat half of the oil over medium-high heat. Add celery, onion, carrot, Brussels sprouts and stir fry 3 minutes. Add garlic, ginger and stir-fry 2 minutes more. Add the rest of the oil to the skillet along with the chicken. Bring to a boil. Reduce heat, cover and simmer for 7 - 10 minutes longer, until the vegetables are just tender - but not over-done.